Noticed the other day that ribs are big in the stores, now that summer has officially begun. Seems like a good time to offer a fave take on those bad boys. Now first off, I admit here and now that M does ribs better than I do in terms of process, so I’ll just synthesize her method and my seasoning. So why are ribs so dang tasty; there’s not much there, so what’s the secret? In a word, bones; bones and some marrow influence, too. Little cuts of meat attached to the stuff that we use to make amazing stocks, soups, stews, and reductions from, that’s the ticket. When cooked low and slow, the influence of the bones and marrow make their presence known in a way nothing else can really emulate. Do you know your ribs? All of ’em? Here’s a quick run down on the variations you’ll find out there. Or spare ribs, either spelling works, and either way, it always means pork, period. Spareribs are cut from the side or belly. Nowadays, they’re usually sold trimmed and ready to go, but you still may find them offered with the brisket bone attached; if you get them that way, just cut the bone out and save it along with the rest for making stock. Spareribs may or may not have the skirt attached, (a thin flap of meat that runs along the meaty side). If the skirt is there, you’ve got St. Louis style ribs, and if it’s trimmed off, you’ve got Kansas City style. If you ever wondered what those two terms were all about but were afraid to ask, you may now consider yourself enlightened. If you’re serving spareribs as an appetizer, two ribs per person will do the trick; a half rack, (six ribs), is a decent entrée portion. 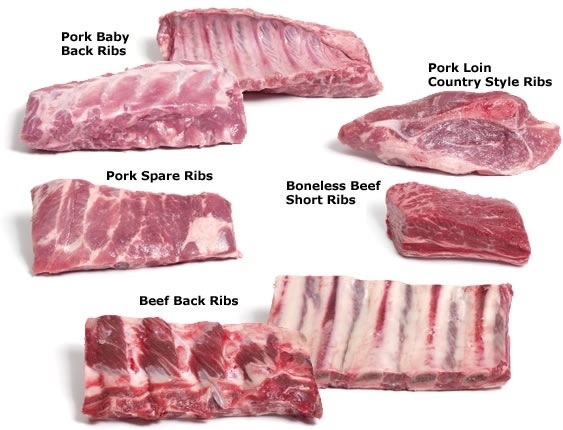 Arguably the most popular pork rib variety, baby backs are less meaty than many other styles, but tend to be leaner than their bigger cousins as well. Baby backs are, in fact, cut from the back of the rib cage. They tend to include a high proportion of loin meat, which explains their lean and tender nature. Reasonable portions for baby backs are 3 ribs per as an appetizer, or a half slab entrée. This cut is a bit of a misnomer. Cut from the sirloin or rib end of the pork loin, this meatiest variant of the rib family doesn’t really include ribs at all. You can often find this cut in single portion packages, as well the equivalent of a half or full slab; they’re perfect for those who want to use a knife and fork instead of getting all handsy with their meal. Country ribs can be pretty fatty and may need some trimming prior to cooking. Portion sizes are one apiece for appetizer, two as an entrée. These big ribs come from the back of the loin; they’re the beef version of baby backs. Meatier than pork ribs, they contain five or six bones per slab. That said, while the bones are big, they’re not super meaty. They will, however, be plenty tasty if given a good rub and lightly smoked. Portions are two per as an appetizer and five or six as an entrée. This cut used to be a tremendous bargain, until every chef in the world decided to make them popular. Now, they can often be pricier than they’re worth – If you see other cuts for much less, buy those. 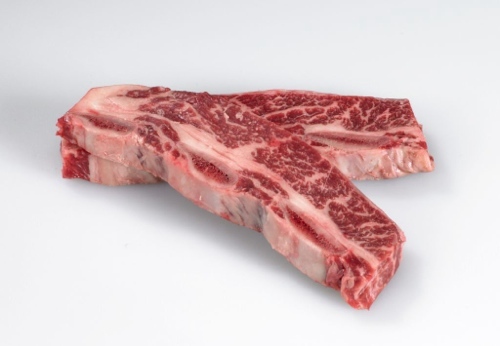 Short ribs come from the bottom end of the rib cage, or plate cut. Short ribs are not a tender cut and really shouldn’t be grilled or barbecued; they need low and slow braising or smoking to really shine. The cut can be fatty, so trim as needed before you cook. A quarter pound appetizer and half pound entrée will do the trick. 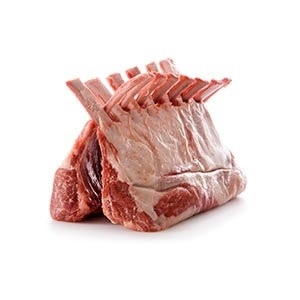 A full rack of lamb contains eight ribs. The ribs themselves are really quite skimpy, so the chop is typically left attached;you’ll find them offered as rib chops or as a whole rack. The racks are a fairly famous cut and make a great roast. Fancy stuff has been done with these for many moons, like cutting the rack into 3-3-2 and tying them tips up as a crown roast, or trimming the meat at the tips of the chops back to the bone, which is the famous French chop or rack. A double French rack is two racks tied tips up back to back. If you’re not familiar working with the lamb rack cut, make sure to ask if the chine, (backbone), between the ribs has been cut, so that the roast is easy to carve. If you’ve not cooked a lot of lamb before, be aware that it’s usually quite a bit gamier than beef and pork. The heart of the gamy flavor is fat, so trim appropriately if you’re not comfortable with that. Soaking lamb in buttermilk for at least 2 hours and as much as overnight will help a lot to tame the game and keep them moist and juicy. While you can certainly cook and serve single rib chops, you’ll get a much juicier result if you leave them as doubles; you can then cut them into singles for an appetizer and leave them doubled as an entrée. Then there’s game; I’ve personally had and cooked venison, elk, boar, buffalo, bear and ostrich. The first thing to remember with game ribs is to use them; I don’t know how many hunters and cooks I’ve known who don’t even consider this, but we all should. First off, if you harvest, you’ve got the responsibility not to waste, and that’s a biggy. Seconly, if you love game, ribs can and should be a signature taste of the beastie. As with lamb, game ribs can be gamy, so trim the fat, if any, and marinate. Buttermilk works great here, but wine and herb, or a nice flavorful brine will shine as well. Keeping in mind that fleet-footed game like deer and elk are quite lean to begin with, so marinating will do a lot to keep things tender and juicy. Here’s a wet rub and BBQ sauce that will go great with any of the above. This recipe will serve for a couple of racks of ribs. We’ll do a low and slow cook with a grilled finish for knockout flavor. Rub ribs generously with the olive oil. In a mixing bowl, combine the honey, paprika, pepper, onion powder, garlic and Tabasco or chile powder, and the smoke powder if you’re using that. Rub evenly over the ribs, taking time to work it on to all surfaces. Wrap racks, meaty side down, in a large piece of metal foil (The wide, heavy duty stuff does best; if you’ve got light weight stuff, double it). Seal the edges of foil with a double fold. Cooking Stage 1, oven low and slow. Cook smaller, more delicate ribs like baby backs for three and a half hours; the bigger ones can go four hours. Preheat grill on high, then reduce heat to low with lid open. If you’re just using your oven, leave it at 225° F.
Remove ribs from oven and drain off any excess drippings. Carefully flip ribs over to bone side down, using a big grilling spatula or two smaller ones. Your ribs should be at the pint where they’re starting to fall off the bone, so be gentle. Trim the foil back to so you’ve got a baking sheet kind of affair, with a 3/4″ inch lip of rolled foil all the way around the ribs, to catch juices and keep the sauce in place for the remainder of the cooking. Apply an even, thick layer of sauce to the meat side with a basting brush. Transfer ribs to the grill if you’re going that route. Cook on low heat, with the lid down, for 20 to 30 minutes more. If you’re using the oven for the whole job, cook uncovered for 20 to 30 minutes more. Remove from oven and serve promptly with more sauce, house made potato salad, and baked beans. A nice local Pilsner, Lager or dry white wine is the perfect accompaniment, refreshing your pallet and cutting through the fat for that next juicy rib. Peel and dice onion, peel and mince garlic. Zest and juice the orange. Use a nice, fresh local Porter or Stout. Throw everybody into a large stainless steel sauce pan over medium high heat and blend well. As soon as the cranberries start to pop, reduce heat to achieve a nice, steady simmer. Allow to simmer for 1 hour, stirring occasionally. Process sauce with an immersion blender, or carefully transfer to a blender, if that’s what you’ve got. Be very careful if you use a blender; process in batches and watch out for the hot sauce. Process until the sauce is uniform and smooth. If you don’t have an immersion blender, AKA. A motor boat, go buy yourself one for Christmas, they’re indispensable. If you like your sauce a bit chunkier, as we do, you’re done; if you like it smoother, run the sauce through a strainer once. 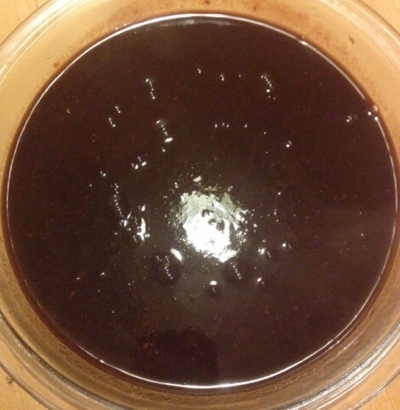 Transfer to a glass bowl or jar and refrigerate for at least 4 hours prior to use, to allow the flavors to marry and the sauce to finish thickening. And remember, save those piles of bones for making pork or beef stock; they’re way too good to toss!